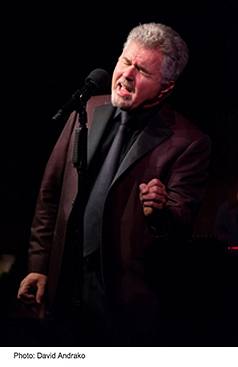 Now in his twelfth year performing at the Café Carlyle, Steve Tyrell exulted in the packed house and sold out nights for the holidays. No wonder he seemed so comfortable and set the mood with "I've Got My Love to Keep Me Warm" and "You'd be so Nice to Come Home To." David Mann on flute brought the comfy mood home, and Tyrell introduced him and "the best band in the world," including Quinn Johnson on piano, David Finck on bass, Bob Mann on guitar, Kevin Winard on drums and Jon Allen on keyboards, A dozen years is impressive, and the occasion for Tyrell to reminisce about his very first time at the Carlyle, with George Steinbrenner in the house. Understanding that audiences rarely ask for songs by the songwriters' names, only by the crooners who made them famous, Tyrell made sure to mention the writers as he segued from "What a Little Moonlight Can Do," how Harry M. Woods wrote the song Billie Holiday made memorable, to Vernon Duke and Ira Gershwin's "I Can't Get Started with You," leading to Dorothy Fields' "On the Sunny Side of the Street" and "The Way You Look Tonight." This time, her son, David Lahm, was present. Inevitably the songwriting theme would come to the legendary Brill Building, 1619 Broadway, and Burt Bacharach and Hal David's "This Guy's in Love with You." Steve Tyrell is too smooth to let it all rest on the songwriters: What about those great American singers? Ray Charles' "Georgia," Billy Joel's "New York State of Mind," and foremost, Frank Sinatra's "That's Life." And with a nod to the season, Steve Tyrell closed his entertaining set with a bluesy "Merry Christmas Baby." Yes, he really made his band sing, "Rudolf the Red Nosed Reindeer."